4seating.com Blog: Star Wars: Worth The Hype? With the announcement last year that George Lucas had sold Lucasfilm over to Disney, there was some nervousness among the faithful. The legendary Star Wars franchise--which continues to be as popular as ever, in spite of the tepidly-received prequel batch of films released a decade ago--was now going to be put into the hands of the studio known for The Jungle Book and The Lion King. However, Disney moved to reassure audiences by announcing the pre-production on Episode VII, a sequel to 1983's Return Of The Jedi which was going to feature original cast members Mark Hammill, Carrie Fisher, and Harrison Ford reprising their roles as Luke Skywalker, Princess Leia, and Han Solo. The director of the new film, JJ Abrams, is the mastermind behind Lost and the Mission Impossible films, who has also recently re-booted the Star Trek franchise to great success. Furthermore, the studio has said that there will be a Star Wars-related film coming out every year, starting in 2015 with the release of VII. The announcements sparked much discussion and excitement among fans, with Yahoo! entertainment news featuring an article about the script and casting for the new film, virtually every week. 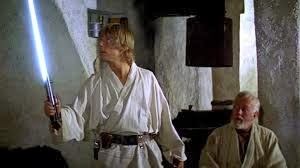 1) STAR WARS (1977): the original film that started it all, now retitled Episode IV: A New Hope, is still a roller-coaster ride. A groundbreaking film on release, with special effects which blew audiences right out of their seats, those effects look more antiquated with each passing year although the art direction remains superb. Fortunately, the film was more than its special effects--the plot, characters, and dialogue are virtually immortal, winning over new generations of 6-year olds every time, while still providing plenty of heavy nostalgia for older viewers. It's an all-time, undisputed movie masterpiece. 2) THE STAR WARS CHRISTMAS SPECIAL (1978): this infamous train wreck aired on TV for the Christmas season in 1978 and was never broadcast again. However, the "it's so bad, it's good" quality of the thing lived on in legend, where it can now be seen on youtube. Simply hook a tablet to your screen, to experience this surreal disaster in all its cringe-inducing awfulness! 2) THE EMPIRE STRIKES BACK (1980): Widely considered the peak of the franchise, this darker, edgier movie packed in thrills galore. Luke Skywalker meets the grammatically-challenged master Yoda, Darth Vader gets his revenge, and Han Solo becomes an intergalactic hood ornament--what's not to love? 3) THE RETURN OF THE JEDI (1983): the concluding film to the original trilogy, Jedi divided fans and critics on release, but looks better with each passing year. The cutesy-cuddly Ewoks--once considered a shameless marketing ploy by Lucas--really aren't as offensive as they originally seemed, and the action packs as much of a punch as ever. 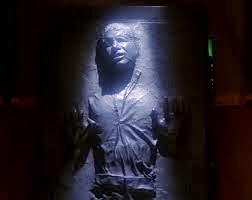 Besides, seeing a barely-clad Carrie Fisher chained to Jabba The Hut has become semi-iconic in itself. 4) THE PHANTOM MENACE (1999): One of the most anticipated movies in history raked in at the box office, but was greeted with scorn and derision by fans. 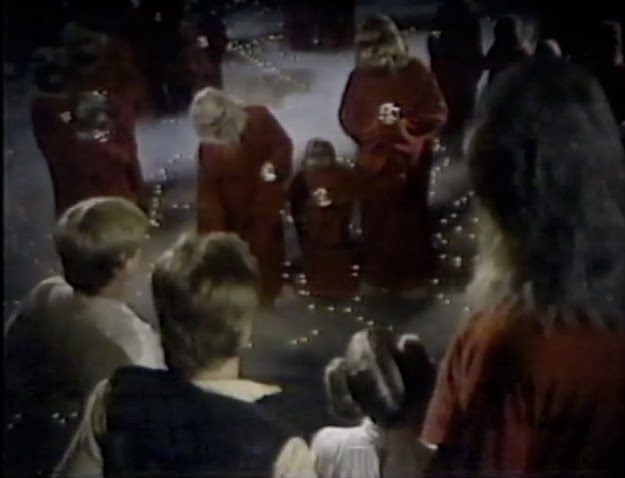 Unlike Jedi, it hasn't aged at all well, either--it's pretty much a disaster barely a notch above the Christmas special, with wooden acting, a childish plot, and surprisingly stilted direction by Lucas. Jar Jar Binks: need I say more? 5) THE ATTACK OF THE CLONES (2002): This film was greeted with much the same poor reception as The Phantom Menace, and does indeed proceed much as its predecessor had, although this writer finds it redeemed by the high-power action sequences which take up the final 45 minutes of the film. Lucas was very slowly getting his directing powers back--but really needed to work on the dialogue. And still, more Jar-Jar. 6) THE REVENGE OF THE SITH (2005): While the final film of the prequel trilogy still suffers from some of the elements that marred its two predecessors, it is a vast improvement overall. 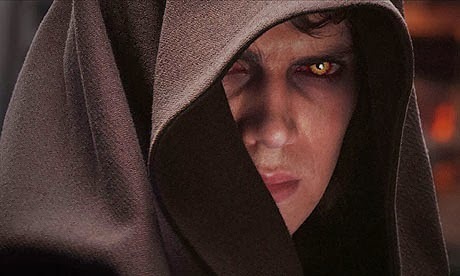 It's the darkest film of the franchise since Empire, and the fallen-hero plotline--with Anakin making his transformation into Darth Vader--is compelling (although there are some obvious plot holes). The acting and dialogue is also a substantial step up, although still not a patch on the original trilogy. Of all the films of the prequel saga, however, this is the one worth seeing. The Star Wars franchise is such that there's been a large number of ancillary projects that have come and gone over the years: an early 80s Ewok TV special, comic books, novels, video games, and an animated series (The Clone Wars). A new animated series (The Rebels) is also in the works. With so much to choose from, there's plenty to keep you occupied in your home theater seat until Episode VII arrives sometime at the end of 2015. If you have kids, you can get them started on the legendary first two films, and work your way from there--although be forewarned, not even children find The Phantom Menace or Attack Of The Clones all that engaging (for a good prequel alternative, The Clone Wars is an interesting one to stream on the internet). A Star Wars theme works great for birthday parties, which can be held right in the comfort of your home theater. May the force be with you!